After releasing an EP 'The Brightest Void' as a prequel for 'The Shadow Self', 2016 has been intense for the Finnish ex-Nightwish singer Tarja Turunen. She started 'The Shadow Shows' – a European tour – right after the summer festival season to promote the new album. Being French, I planned initially to attend one of these shows in France – Lyon or Paris – but due to the high Parisian prices, I finally found a reason not to go. However, being in the Netherlands in March enabled me to go to the city of Enschede to attend one 'Shadow Show' from the second leg of the tour. I arrived only thirty minutes before the doors opened but had time to talk with a very nice old fan of the Finnish lady and then I got (very luckily) in the front row. The venue, Poppodium Atak which is located in the centre of Enschede, has a capacity of six hundred with a standing area and a balcony. It is a very modern and conventional venue for small capacity concerts. Two support bands appeared first; Skinflint, an African Heavy Metal band from Botswana and My Own Ghost, a Female-Fronted Metal band from Luxembourg. Skinflint had to play in front of very few people whereas My Own Ghost had more success and that is certainly a good sign for the release of their second album. Tarja started her set around 10pm in a one third empty venue, the balcony was closed and the standing area looked (to me) really empty. After an instrumental intro track, the first song to open the gig was 'Demons In You', which featuring Alissa White-Gluz on the studio record but here was sung solo. Of course, the growling brings a lot to the song but that remained a nice opening track. '500 Letters', 'No Bitter End' and 'Lucid Dreamer' followed. Tarja seemed to feel comfortable, smiled a lot and joked with the crowd. She danced, jumped and tried to make people dive into her atmosphere. The lights were bright, colourful and always targeted the singer. She was frequently posing, slowly and with grace, as she really knows how to do. That is to me rather caricatured but so nice when Tarja does it! After this, 'Eagle Eye', the only proper song from the EP 'The Brightest Void' was played. That's a real shame because some of the melodies are really intense and potentially energetic live but this EP has definitely been under-represented on the live stage. 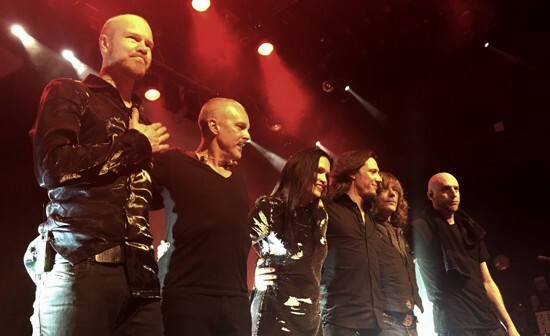 'The Living End' and 'Calling From The Wild' led to a Nightwish medley shared between 'Tutankhamen', 'Ever Dream', 'The Riddler' and 'Slaying The Dreamer'. Thanks to the audience reaction, it seemed that I was not the only one expecting Tarja to sing some Nightwish songs. Unfortunately, the songs were not played as full versions and Tarja's voice evolution makes 'Ever Dream' sound awful! On the other hand, Tarja's musicians (including Alex Scholpp on guitar) were impressive and brought a formidable energy to the last part of the medley and 'Slaying The Dreamer'. At this point of the set, the stage changed for an acoustic organisation during which another medley was played; 'Until Silence', 'The Reign', 'Mystique Voyage', 'House Of Was' and 'I Walk Alone'. Playing this type of medley really annoys me. I can't dive into the song. I had the feeling of listening to a mash- up done to cover as many tracks as possible. 'Love To Hate', 'Victim Of Ritual', 'Undertaker' and 'Too Many' closed the show. The encore comprised of 'Innocence' with an outstanding keyboard introduction and 'Die Alive'. Finally, 'Until My Last Breath' brought the gig to a conclusion. My final impression of the show was definitely that I had attended a very professional concert, with nice lights, good musicians and really intense vocals. 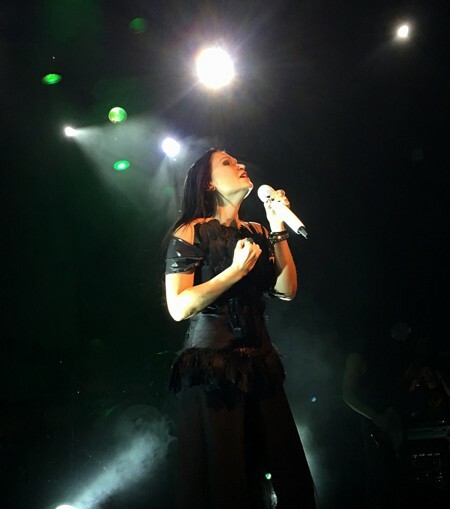 The last album 'The Shadow Self' had been massively represented and Tarja had the chance to present some of her new material to a very devoted fan base that continue to follow her despite the move towards Soft Metal/Rock compositions. However, I felt something was missing. Maybe this was due to Tarja's over-actions, my missing the context of the words she said in Dutch or because of the half empty venue... or maybe all three. So, even if 'Colours In The Dark' and 'The Shadow Self' are darker and deeper than 'My Winter Storm' and 'What Lies Beneath', the level of heaviness is still low and the songs sound deeper on the studio record. As long as the ticket prices remain affordable, I will give her music and her band the opportunity of supporting this kind of music, which is not really popular in France.